Sheryl Sandberg knows a thing or two about leadership. After all, Facebook’s chief operating officer also served as a Google VP and wrote Lean In, an advice book for women who aspire to take positions of power. But Sandberg also knows how to lean on other women for support and she revealed her inspiration for that mindset to Lena Dunham in a recent interview on Lenny Letter, Dunham’s digital newsletter about topics like feminism, style, health, and politics. In response, Sandberg cited her grandmother, Rosalind Einhorn, who was a first generation college graduate, cancer survivor, and business owner. “She grew up poor and her parents divorced, which was unheard of during that time,” Sandberg told Dunham of her grandmother’s situation. When diagnosed with breast cancer in her 30s, Einhorn turned her focus to helping other women with the disease and raised money for breast cancer screenings. “She literally drove around selling watches out of her car to raise money,” Sandberg said. Sandberg cited her mother, Arianna Huffington, and interviewer Dunham as other sources of inspiration and strength in her life. “When you look at successful women, they have other women who have supported them, and they have gotten to where they are because of those women,” she said. 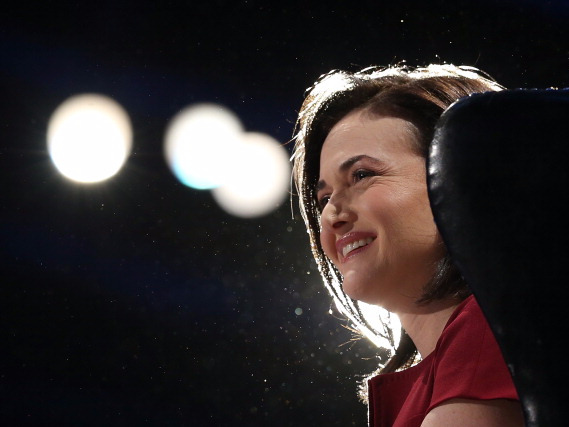 The two discussed Sandberg’s new initiative, Together Women Can, as well. For more on the initiative and about Sandberg’s life, read the full interview on Lenny Letter.